This write up is again taken from Sai Leela Magazine. But it is not an experience of any devotee, but signs of true devotee of Sai Baba are observed by another Sai Devotee (who has written the article). There are many devotees who love Sai Baba in their hearts only. They never try to show off their devotion to anybody and just wants that Sai Baba should see them. Such devotees are very different from others and can be easily differented. A true Sai Devotee never bothers about name, fame, money or power. He thinks Sai will take care of him and fulfil his needs. He is neither weak nor meek. He trusts Sai with his destiny. He may not be a highly literate or influential person; but his persona makes him different from others. I used to visit various schools of my organisation for surpise checking of cash. Since I went without prior notice, I went as a lay man and sat in the staff room waiting for the principal. The neatly dressed peon of the school saluted me (though a stranger to him) and then cleaned the photos, furniture and all the articles on th estaff tables including the phone. He changed the drinking water, replaced old flowers with new ones, reared and nurtured by him in the school premises and then lit incense sticks before the imae of his beloved Sai. He kept a glass tumbler filled with water and a plastic photo of Sai., which got magnified in the glass tumbler. 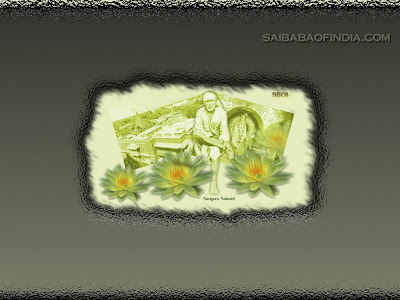 He kept a rose in a glass tumbler and also one at the Feet of Sai. The whole room was filled with the fragrance and created a serene atmosphere. Besides, he did not forget to place some issues of Shri Sai Leela and the daily newspaper before me. He held the lowest rank in the school hierarchy. On subsequent visits to that particular school, I purposely went early to observe him. I never saw him talking loudly or shouting at anybody. Upon inquiry, I gathered that the entire school staff including the principal respected him. Even children called him 'Uncle'. Every month I visit a particular hair dressing salon. There are many others in the area; but this hair dresser is different. In his shop, smoking is not allowed. 'Those who object are free to go elsewhere' he says. He also request his customers to remove their shoes before entering the shop, since he thinks of it as his temple of Sai. Devotional songs of Sai are played in a low tone. I once asked him, whether he was not bothered about all his strict rules affecting his business. He said, when his daily ration is being sent by Sai, why should he worry? Whatever is in store for him will definitely come, and whatever was not in his destiny wouldn't. On another visit he told me an old proverb 'Maro so jave nahin, jave so maro nahin' which meant 'Whatever is mine will not go away, what goes away was never mine.' People who live on this simple precept will never face any tension or distress. These are ordinary people, who are Sai Devotees first and last. They feel, they are mere tools in Sai's hands. I have never seen them morose, murmuring, shouting or speaking loudly before others. They are not conspicious, we have to spot them and identify them. Are these not sufficient indelible marks of Sai Devotee? Sai Ram. Both the devotees mentioned are fairly simple, not very highly educated and thus not highly burdened by the intellect. And that is the secret of success in the path of bhakti. The simple women of Shirdi and the simple milkmaids of Brindavan had a similar advantage. For the well educated man (whether the education is western or vedic is not important), a process of unlearning is needed before the mind is light enough to see the greatness of others. Sai, the great Master accepts all of us and strips away the layers of intellectually contaminated ego and will draw us to Him. Sai Ram. Rightly said Mr. Swamy, many a times we educated people make simple things complicated and so we are not attracted towards Bhakti. This in turn proves to be worthless in front of those unlearned people. These two devotees has practically shown us the simplest path of devotion and that is simplicity and humbleness. Sai Ram. Every one is a Sai devotee, including the atheists, the sinners and all! Why? Because, Sai is Universal (Spiritual, Absolute and Infinite is SAI) and is beyond all attributes. Thus for Him, positive and negative attributes are equal. So, whether you call yourself a Sai devotee or not, you are. And when you are named Sairam, how can you escape? Your destiny is clear, you will have to surrender and merge into Him. this is really very true.. im a sai devotee initially wen i had not surrendered to baba i felt distressed n was frustrated due to sum matter n wud scream at my family members.. but now wen i've totally surrendered to baba i really don hav ny tension bout my future n every one are shocked to see me so humble n pleasant tat is really power of our baba,wen we have surrendered our life in his feet then then there is no space for worry or tension in our life.. our sai takes care of evrythin.. "when we leave everythig in baba's hands, eventually we see baba's hand in everythig". Very right Said "when we leave everything in baba's hands, eventually we see baba's hand in everything".